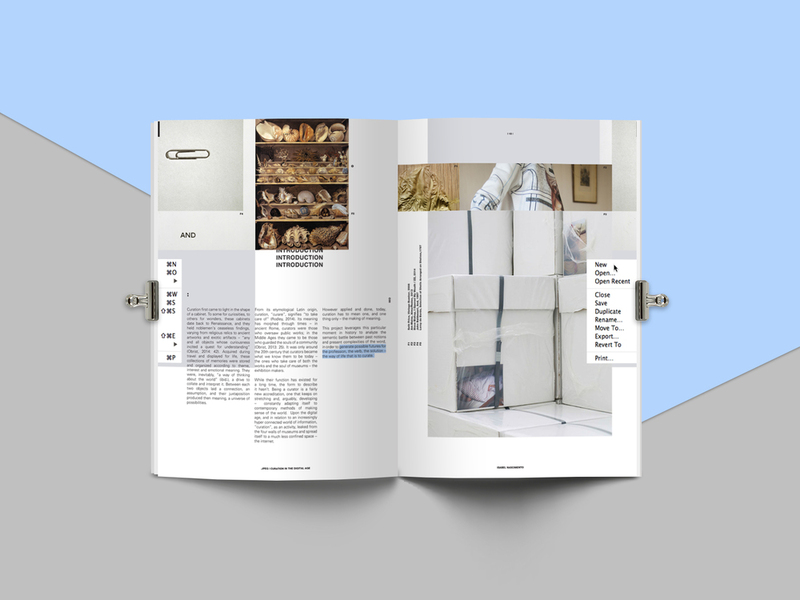 JPEG is a visual report exploring how, in relation to an increasingly hyper connected world of information, curation, as an activity, leaked from the four walls of museums and spread itself to a much less confined space — the internet. This self-devised project envisioned to merge online curation with its offline form, so as to add credibility to the first and keep the latter appealing for generations to come. Museum were, for a very long time, people's primary messengers of the unknown, the unseen and, conceivably, the unforgettable; the curators its senders. Today, they are competing with the Internet for their receiver's time, attention and relevance, as they become tastemakers of their own. JPEG directs, fosters and leverages online curation, being a gallery in its form and a Tumblr in its function. Interviewees include Victoria Broakes, Head Curator of the V&A, John Stack, Head of Digital of TATE and Domenico Quaranta, Post-Internet Author and Curator.